Sofie co-founded ImmunXperts in 2014 with a mission to support drug development processes in the fields of immuno-oncology, immunogenicity assessments and cellular therapy. ImmunXperts is a contract research organization (CRO) specialized in bioassay development. Its team of immunology experts provides comprehensive, flexible and collaborative support based on the specific needs of their customers. 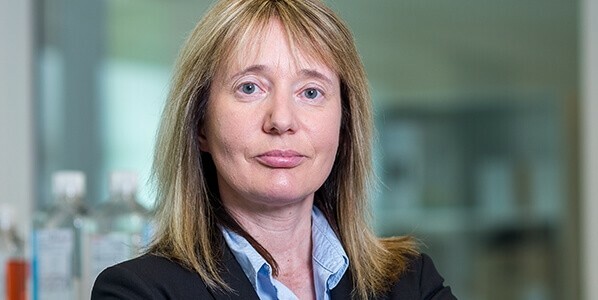 As the chief technology officer (CTO) of ImmunXperts, Sofie brings over 20 years of experience in the field of immunogenicity assessments, and a passion for her company that is evident in her interview below. 1. What inspired you to pursue scientific research? The possibility to maybe be able to make a small difference in the battle against cancer and other diseases made me go into the scientific direction. I’ve always been very lucky to have inspiring managers and mentors in the majority of the roles that I’ve had. They always encouraged me to go for the extra mile and inspired me to think out of the box. Next to that, I really like what I’m doing. It doesn’t feel like ‘I need to go to work’ but more like each day, another exciting adventure awaits. My job allows me to use my scientific knowledge and curiosity and management skills. 3. Tell us about your current role. My current role is founder and CTO. In this role, I can assist in understanding the customers’ needs, explore new technologies and advances in the field and support and train our scientists. It is great to be able to work with a top team of intelligent and passionate people. 4. What do you enjoy most about your role? The direct contacts with the customers’ scientists are really enjoyable, also being able to support them with the development of safer and more effective drugs gives a lot of satisfaction. I also really like to help developing others and getting the best out of each individual. 5. What has been the biggest thing you learned in your journey? This fantastic journey taught me that I should always try to be a better version of myself and never give up, even when things look impossible, one should always try. I really like the Japanese culture, and look at things in a ‘Ganbaru’ way: fall down seven times, get up eight! 1. What were the needs that led to found ImmunXperts? Before creating ImmunXperts, we organized informative meetings with potential customers and asked them what was lacking in the field and what we needed to do differently to become their preferred CRO. Based on that input, we combined our own experience and knowledge with creativity to offer a model that has allowed us to become a flexible partner with a network of experts. We are proud to say that ‘we think with you’! 2. Tell us about ImmunXperts. We are a company offering solutions for all immunology related questions. Our current foci/strengths are functional assays in the fields of immuno-oncology, immunogenicity assessments and cell therapy. We have worked on projects big and small, ranging from training and helping set up departments in these fields, to providing regular functional assays to test customer products. Our strength is in the flexibility and collaborator mindset when working on all projects. We listen to the issues our customers are facing and bring in our experience and will do additional research to find the perfect solution for all of our customer projects. 3. How is ImmunXperts making a difference to its customers’ work? Many of our customers face issues when setting up some of the assays which we are able to offer. Many of these assays need a lot of optimization which requires vast experience and know-how in immunology to successfully set up. We bring in the experience and enable our customers to test their products without having to spend their valuable time trying to set up an assay. 4. What are the main challenges and complexities that you are facing? Especially in the field of immuno-oncology, everything is evolving so fast with new hot targets coming up all the time. We need to always keep our eyes and ears open to see what the latest trend is and really try hard to stay ahead of the game and be able to offer assays that are in high demand. 5. What does the future look like for immuno-oncology in your company? The field is continuing to develop at a very fast pace with more players entering the immuno-oncology field and more new targets are being discovered. With the development of immuno-oncology drugs, immunogenicity is also becoming very hot again. We believe these fields will continue to develop at a very fast speed and the future is looking bright for our company as we continue to try to offer the latest and best solution for our customers. 1. Why does your team need purified immune cells? We perform a wide range of immunology assays, and for that we often need specific cell populations like monocytes or CD8+ cells. We have access to a cell sorter but in the majority of the cases, bead-based isolation is a rapid and easy way to get purified cells. 2. How is your team obtaining these purified cells? We mainly start from PBMC or tumor tissue and use bead-based selection to isolate the population of interest. We use a variety of products like the monocytes, CD4, CD8, NK isolation kits. We use both positive and negative selection, depending on the application or assay. 3. Why do you choose STEMCELL’s cell isolation products? I was impressed by the easy-to-use procedure and the fact that it often takes less than 15 minutes to get the cells of interest. There is also a wide range of products available, both for our human and mouse related work. A mini-review of our selection of key advancements in CAR T cell therapy research. 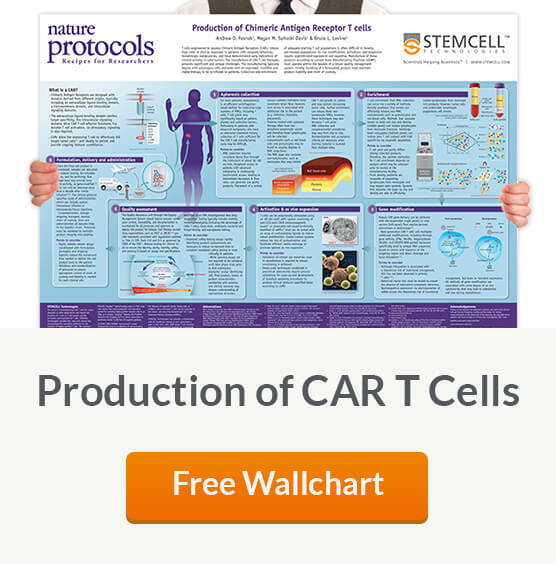 Free Nature Protocols Wallchart summarizing the processes involved in producing CAR T cells for therapy. A mini-review of our selection of key advancements in cancer immunology research.